One of the most efficient ways to promote a website or a product is by using social networks like MySpace, Del.icio.us, Digg and many others, making it easy for your visitors to promote it by adding it to their bookmarks in the social network of their preference. To make this possible, the bookmarking option should be only one click away, - fast and easy to use. Using this resource, you obtain free publicity and lots of visits from social networks. TDE Social Bookmarks is an extension for Dreamweaver that allows you to include in your page 35 bookmarking links to various social networks as well as bookmarks for current browsers, all this in one step from the Dreamweaver menu. Selected bookmark links will be generated in your page with their respective icons and the necessary parameters according to each social network's requirements. The page title for the bookmark can be specified manually, although initially, for your comfort, it is identified automatically. You can also choose to identify it automatically in real time, which allows to use the same code for many different pages, something very important if you are generating pages dynamically. In the same way, you can enter your page's URL manually although it is recommended to leave it to be detected automatically in real time. These features allow to use this extension in any context - static html pages as well as dynamic pages. Note: This product does not require any server side script. If you are looking for a fast guide and sample, please check our video tutorial. Additional Info: Social Bookmarks Inserter - Online FAQ. Double click on the downloaded .MXP file to install the extension in your Dreamweaver. Restart Dreamweaver to complete the installation. Open the page where you wish to insert the bookmark link. This page must be saved within your website, defined in Dreamweaver. 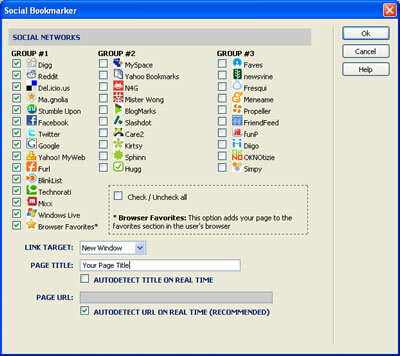 Social Networks: select the social networks that you wish to include in your page. Link Target: Select if the bookmark link should open in a new window (recommended), or in the same window. Page Title: The title for the bookmark. There is an option to detect the title automatically (which makes this field optional). Page URL: URL for the bookmark. We recommend the option of automatic detection. After this step, save your page and remember to upload the folder "tde-bookmark-images". This folder contains the icons of the social networks. How to use this extension in dynamic pages? To use TDE Social Bookmarks in dynamic pages, simply mark the option "autodetect Title/ URL in real time", this way each page will assume correct values when shown in the browser.